Ever-expanding city limits and contemporary lifestyle demand fast, consistent and multiple alternatives for easy commute to anywhere anytime. 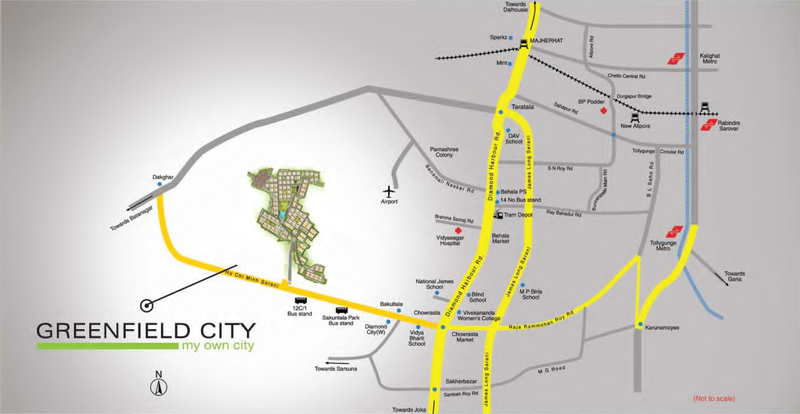 Imagine a living space sited strategically close to the both traditional and ultramodern means of transport. Be it roadways, rapid transports, railways or even air travel. Time taken to reach places estimated around 11 am of a normal working day. Nearest Metro Station - Tollygunge: 30 mins. Auto connectivity to and from the Behala Chowrastha: 10 mins. Shakuntala Park Bus Stand: 2 mins. Own bus service from Greenfield City to Tollygunge Metro and back, exclusively for Greenfield City residents.